Item Description: Inspired by the sheer simplicity and weatherworn beauty of primitive furniture, Gavelston chairside end table brings a relaxed sense of style into your space. Stow remote controls, gadgets and various whatnots in the handy drawer and cabinet. 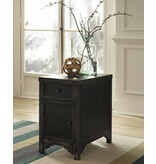 Series Features: Tables are made with select veneer and solids in a dry vintage weathered black finish. Framed drawers and aprons. Small wrought looking dark bronze color accent hardware. T732-1 and -4 have a shelf for extra storage.